Malaysia: A country that has a merit of multi-ethnic. What one can offer to the client as a foreign architect? Served in the Ground Self Defense Force (Japan) for 6 years. Graduated from Oklahoma State University, School of Architecture in the USA in 1992. After graduation, worked for Kohn Pedersen & Fox Associates and Hellmuth Obata and Kassabaum Inc.
in the USA. After returning to Japan, worked with Kajima Design. Since 2004, moved to Malaysia and now operating the design firm - Hasegawa & Xavier Associates (HXA) in Malaysia. The Association of Southeast Asian Nations (ASEAN) is a geo-political and economic organization of ten countries located in Southeast Asia. The ASEAN market has become a very attractive market for advanced nation such as the USA, Europe and Japan in the last decade. It became increasingly important to these countries after the world economic crisis in 2008. ASEAN countries were considered cheap labor nations. For this reason, many foreign companies set up factories in ASEAN countries. Over time and economic growth in these countries, ASEAN countries are becoming great “consuming market” in the global market now. The GDP growth for most of these countries has remained not less than 5%, despite even after the world economic crisis. Population’s growth is increasing continuously as well. Japanese construction industry has big business opportunities in ASEAN nations. Firstly, Japan has good diplomatic ties with these countries. The ASEAN people generally have amicable feeling towards Japan. This fact is very important to have good business connectivity in national or private level. The second factor is distance. ASEAN countries and Japan are relatively close geographically and have small time difference. Japan has advantage over the Western countries with merely 1 – 3 hours ahead of any ASEAN countries.Moreover, the advancement of IT technology has bridged the gap further, making the world seamlessly connected through internet communication. This is especially potent as the internet has made the world demands on real time response. For instance, it is norm for a contactor to send photos of ongoing project site, asking the designer for feedback or solution immediately. There are setbacks to expect quick response if one is living on the other side of the globe. Therefore, distance gives an advantage for Japan compare to the western countries. Thirdly, with the fact that construction technology is still lacking in these countries, Japan has comprehensive role to play in terms of contributing new technologies and materials in the construction industry. For example, architects and building material suppliers from Japan can work together with local contractors and clients to design and construct with holistic new approach to the building. Malaysia is physically located at the center of the ASEAN countries; bordered by Thailand, Singapore, Indonesia and Brunei. Comprised of two regions separated by 640 miles of the South China Sea, with Peninsular Malaysia to the west and Malaysian Borneo to the east, the country is a federation of 13 states that is home to an estimated population of 29.2 million people. 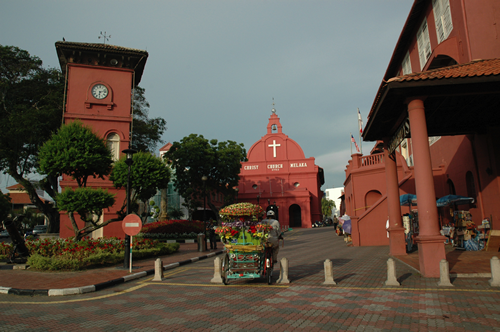 Malaysia is often described as Asia’s Cultural Melting Pot. Ethnic Malays make up 50 percent of the population, Chinese a further 23 percent, with Indians and indigenous peoples forming the remainder, according to the Malaysian Demographics Profile 2012. Globalization has had positive results on the country’s economic growth through trade expansion and foreign direct investment that opened new channels for economic expansion. Additionally being a multi ethnic nation like Malaysia is an advantage in the global business market. Human has tendency to trust own race. 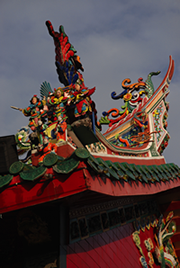 Malaysian ethnic Chinese for instance have good business relationship with its own ethnic counterparts across the globe.Historically, Malaysia also has strong ties with Muslim nations worldwide. English is widely use and communicated in most business dealings in Malaysia. English is commonly use in meetings and written in documents. I have experienced architectural design industry in USA, Japan and Malaysia. My conclusion, in principal, the architectural design and approval process in any these countries are the same. 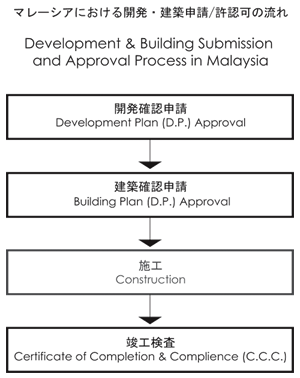 Stepwise in Malaysia, one has to apply to the local authorities for Development Plan (D.P.) approval. After the approval of D.P., Building Plan (B.P.) can be submitted. Once the B.P. is approved, the construction of the building can commence. Upon completion of the building, local authorities will perform inspection to decide if occupancy certificate should be issued. (See diagram-1). These processes are similar to the process in Japan (c.f. Uniform Building By-Laws 1984 (G.N. 5178/85)) for building legal regulations. The Uniform Building By-Laws 1984 provides information on architectural design on i.e. setback, stair width and fire regulations. Standard metric system is used in drawings and English is used for description. However, submission of the drawings is done by locally registered architects. For instance, if one is commissioned to work on an architectural design in Malaysia, corporation with a local nationally registered architecture firm (I think here is more of the person not company– if a company is a Malaysian registered company but no locally registered architect cannot function right???) is required. There is no specified format for contract letter between client and architect. Normally, the contract letter is simple if compared to the ones in western countries. There are a lot of gaps in term of fees and scope of service. The advice would be to have a contract as detailed and precise as possible. The architectural scope of services and fee is stated in Architect (scale of Minimum Fee) Rules 1986. The scope of service is stated clearly for each stage and the minimum fees are based according to the construction cost and difficulty of design of building types. It is fairly common for the client to impose fee less than the minimum fee and to delay payment in Malaysia. Nonetheless, foreign consultants are paid well compared to the local consultants. However, it is advisable to state the payment terms and condition clearly in the contract letter. See reference at the end of the article for the website to download “Architect (scale of Minimum Fee) Rules 1986”. A vast difference between Japan and Malaysia in architectural design and construction process is at the construction site. The construction management is still under developed in Malaysia. For instance, in Japan, if there is any discrepancy between architectural drawing and structural drawing, contractor will point out and refer to relevant person in charge. However, in Malaysia, contractor often build structures just by reading structural drawings drawn by engineer. I have experienced many time that the detail of reinforced concrete beams and columns joints were not done accordingly to architectural design. 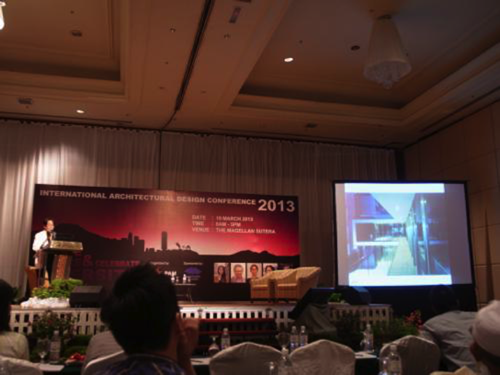 The tendency of local contractors in Malaysia tend to put less effort on understanding of the intention of architect. It is important for the consultants to establish good communication with contractors. It is a common issue that, in developing countries, the basic rules and systems are not properly in place compare to developed countries. If there is intention to penetrate into these markets,it is important to consider a risk management. In Japan, taking part in design competition is one way to penetrate into the market, However, design competition is lacking in Malaysia. Network building is crucial to penetrate into the market. One example how this can be done is to give architecture, presentation of one’s work at the Malaysian Architect Association (Pertubuhan Arkitek Malaysia or PAM) through either its headquarter in Kuala Lumpur or regional office located in each of the 13 states in Malaysia. Another avenue, especially for building material supplier, is through participation in the International Architectural Design Conference (DATUM) or International Greentech and Eco Products Exhibition (IGEM) organized annually in Kuala Lumpur. There are booths for rental where companies can display to introduce their products. First and most importantly, it is important to know what the world is seeking for in architectural design. As the world trends indicate, the architect is often expected to design “Sustainable Building”. Same in Malaysia, architect is often requested to design architecture, which is environmentally friendly and low in operation cost. There are another opportunities and demands on building that require special knowledge in design such as hospital design, airport or shopping center. There are risks for developers to engage foreign architects. Some of the common risks are e.g. shortcomings in communication, different expectation on the quality of drawing outputs or workmanship on site. There are also risks of lacking in common understanding especially when it is cross culture dealings. Additionally, for the client the design fee and expenses for foreign architects are usually higher than local architects. Even though, there is some risk involved in engaging foreign architect, many architects in the world are engaged as a foreign architect and doing successful operation. Nevertheless, it is important to ask oneself what one can offer to the client. If you are confident on your products or services, I believe Malaysia is a very high potential and attractive market. Architectural Review and Architects' Journal will end its 120 years history of printed edition of their magazine. Copyright © 2012 AGLOBE INC. All rights reserved.